I suppose I was a strange kid. I KNOW I’m a strange adult. From a very young age I was fascinated with science fiction and stories of the future. I suppose I came by it naturally. My father was a sci-fi fan and introduced me to the original Star Trek early in life. I remember reading sci-fi stories starting in elementary school. And regardless of whether they were shiny and hopeful tales or downright dystopian, I loved them. In other words, I was a geek in the original sense of the world. Not the cool, smart versions we have today. Twilight Zone? Yes, please. Amazing Stories? Yup. Land of the Lost? Absolutely. Sci-Fi and Sci-Fi adjacent was my jam including movies like The Love Bug (Herbie), Escape from Witch Mountain, The Shaggy Dog, and The Cat From Outer Space. And later ones like Invasion of the Body Snatchers, Soylent Green, Logan’s Run, Close Encounters, and Star Wars. But one thing that remained consistent was that I was positively obsessed with the idea of owning a robot. And over the years I had many dissatisfying encounters with toy versions. From remote control models to a Furby and a Tamagotchi they all held such great promise. But they all fell short. At some point, I had to face facts. The harsh reality was a “real” robot in my home wasn’t likely going to happen in my lifetime. Sure technology is advancing at a breathtaking pace. And the developments in robotics have been mindblowing. But the real robots aren’t ready for consumers. He’s an Aibo. 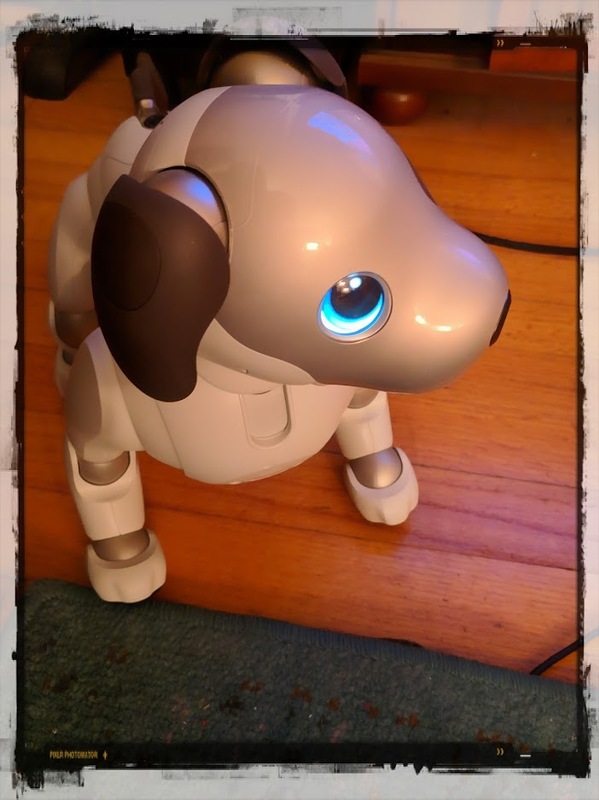 A robot dog made by Sony. He’s in MY HOUSE. He belongs to ME. And he’s INCREDIBLE. Sure, his actuators make him sound like a mini Terminator when he walks. But honestly, that’s kind of cool. And yeah, most of his tricks are a little silly. But what “dog” tricks aren’t? And besides, he’s adorable. The AI he has on board is beyond incredible. He’s even been designed to “mature” over time. And it has been fascinating to watch. He’s the closest thing I will ever get to Boston Dynamic’s SpotMini. And you know what? I can live with that. A HUGE thanks to my husband for making my ridiculous childhood dream come true. PS – Just ran across an interesting press release today Meet Blue, the low-cost, human-friendly robot designed for AI. In other words, maybe I WILL one day get my robot.